Last week, I mentioned a rather sick-to-my-stomach turn of events in Cattaraugus County, New York (where I teach). County legislators want to demolish the Civil War memorial in order to put in a parking lot. In my open letter to the legislators, I made mention of some of the men from Cattaraugus County who’d enlisted in the war. Mark Dunkelman, regimental historian for the 154th New York, was kind of enough to share with me some of their stories, which I excerpted for my letter. However, the blurbs Mark shared with me were so fascinating, even as little micro-snapshots, that I wanted to pass them along (with his permission!). Cpl. Thomas R. Aldrich, Co. B, March 28, 1863: “I don’t care much where we go if it only helps the government to put down this cursed rebellion. I would not give a snap to get out of this until our country is once more united in the bonds of peace and brotherly love. I came down here to protect the government in this her time of peril and I mean to stand by her to the last.” Note: Aldrich was captured at the Battle of Dug Gap on Rocky Face Ridge, Georgia, and endured a grueling imprisonment at Andersonville and elsewhere. Second Lieut. 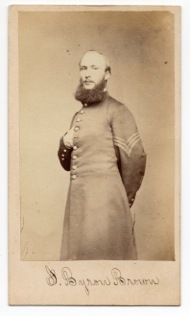 John W. Badgero, Co. A, October 11, 1862, to his son: “I cannot tell how soon I shall be called upon to into a battle and if I do I may never come out alive, and if I do not you must remember your father died fighting for one of the best governments the sun ever shone upon.” Note: Badgero died of disease in June 1863. As I mentioned in my previous post, Mark has been working tirelessly to save Cattaraugus County’s Civil War Memorial and Historical Building. You can read about his efforts courtesy of the Olean Times Herald. If you’d like to help, contact him at nyvi154th@aol.com. This entry was posted in Books & Authors, Common Soldier, Medical, Memory, Personalities and tagged "Hardtack" Regiment, 154th New York, Cattaraugus County, Mark Dunkelman. Bookmark the permalink. How’s that catchy little song go? “Pave Paradise and put up a parking lot”.